We started a tradition of a open gallery during the inception of the space, March of 2015, to give appreciation and thanks to the artists that have always supported us throughout the years. We wanted to continue this tradition by opening the gallery again with new works, live painting, music and excitement that has become a staple in our West Adams home. 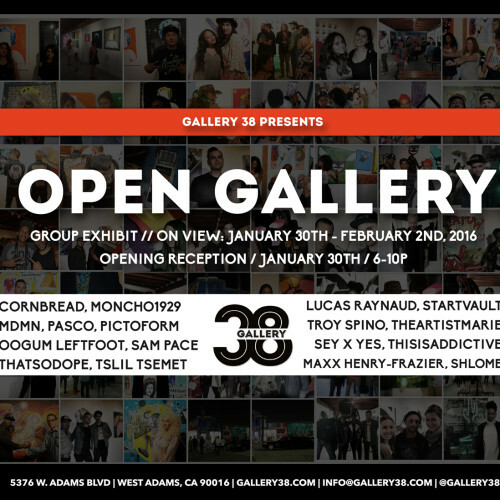 Featuring works by Cornbread, Moncho1929, MDMN, Lucas Raynaud, StartVault, Pasco, Todd Pierce, Sey x Yes, Troy Spino, TheArtistMarie, Sam Pace, Alloyius McIlwaine, OOgum vision, ThatSoDope, Shlome J. Hayun, Maxx Henry-Frazier, ThisIsAddictive & Tslil Tsemet.